Nicklas Bendtner (Danish pronunciation: [ˈneɡlas ˈbɛnˀdnɐ]; born 16 January 1988) is a Danish professional footballer who plays as a forward for Eliteserien club Rosenborg and the Denmark national team. His preferred position is centre-forward, but he has also played on the right side of attack, and occasionally on the left. A large, tall, and physically strong player, he is known for his ability in the air and possesses a powerful header. Having progressed through the youth ranks at Tårnby Boldklub, Kjøbenhavns Boldklub and Arsenal, Bendtner signed his first professional contract with Arsenal in 2005. He made his debut in October 2005 in the League Cup against Sunderland. For the 2006–07 season, Bendtner was loaned out to Championship club Birmingham City, where he made 48 appearances. Following his return to Arsenal, he became a regular first team player, but began to slip out of favour during the 2010–11 season. As a result, he moved on loan to Premier League club Sunderland for the majority of the 2011–12 season, where he made 30 appearances. He then spent the entire 2012–13 season on loan to Serie A club Juventus, where he made 10 appearances but failed to score. Bendtner was released by Arsenal in 2014. He subsequently joined VfL Wolfsburg on a free transfer, for whom he scored the winning goal in the 2015 DFL-Supercup. Released in 2016, he returned to England where he spent the first half of the 2016–17 season with Nottingham Forest of the Championship, and in March 2017 he signed for Rosenborg. Bendtner has played internationally for Denmark at under-16, under-17, under-19, under-21 and senior levels. He made his senior international debut as an 18-year-old, on 16 August 2006 in a friendly match against Poland, and scored his first international goal in that match. Bendtner was a member of Denmark's 2010 FIFA World Cup and UEFA Euro 2012 squads, and helped them qualify for the 2018 World Cup. Bendtner was born in Copenhagen. As a child, he played football for Tårnby Boldklub before joining F.C. Copenhagen's feeder club Kjøbenhavns Boldklub (KB) in 1998. He scored four goals in six Danish national youth team matches, before joining English club Arsenal in August 2004. Bendtner formed a prolific strike partnership in the Arsenal reserves with Arturo Lupoli. His first-team debut for Arsenal came on 25 October 2005 in a League Cup match against Sunderland at the Stadium of Light, as a late substitute for Quincy Owusu-Abeyie. Bendtner was loaned to Championship team Birmingham City in August 2006 to gain first team experience; the loan initially ran until January 2007. He made his debut for Birmingham as a substitute for Stephen Clemence against Colchester United on 5 August. He played the final half-hour and scored the winning goal. The loan at Birmingham was extended until the end of the 2006–07 season. He finished with eleven league goals as Birmingham were promoted to the Premier League as Championship runners-up. Bendtner signed a new five-year contract with Arsenal in May 2007, and returned to the club for the 2007–08 Premier League season. After impressing at Birmingham, the teenage striker was presented with opportunities to seek first-team football elsewhere, with reports that Olympique Lyonnais and Milan wanted the promising teenager, but he stayed on in order to earn his place in the starting eleven. Bendtner scored his first goal at the Emirates Stadium against Paris Saint-Germain in the inaugural Emirates Cup pre-season tournament; he assisted another for Mathieu Flamini and missed a late penalty. His first competitive strike for the Gunners was the match-winning goal in a 2–0 League Cup match against Newcastle United on 25 September 2007. On 23 October, he scored his debut UEFA Champions League goal in the 89th minute against Slavia Prague, finishing off a back-heeled pass from Emmanuel Eboué to complete a 7–0 win and equal the record Champions League victory. Bendtner's first Premier League goal came on 22 December 2007 in a 2–1 Arsenal victory in the North London derby against Tottenham Hotspur at the Emirates Stadium. He headed the winning goal from a Cesc Fàbregas corner just 1.8 seconds (official time) after coming on as a substitute for Eboué, breaking the previous record. His first Premier League start came a week later at Everton; he was sent off for two bookable offences. After serving his suspension, he scored his first FA Cup goal against Burnley on 6 January 2008 as Arsenal won 2–0. During the season, manager Arsène Wenger tried to partner Bendtner with Emmanuel Adebayor whenever Robin van Persie was rested. Bendtner and Adebayor, however, did not get along well. It became apparent during the 2008 League Cup semi-final second leg away at Tottenham when the pair had a heated on-pitch altercation with the scoreline at 4–1 to Tottenham and referee Howard Webb, captain William Gallas, and other teammates had to intervene and separate the two. Adebayor later apologized on Arsenal's website and the Football Association declined to take any formal action against either. Bendtner also scored a last minute equaliser against Aston Villa to keep Arsenal top of the table. The highlight of Bendtner's 2008–09 pre-season was scoring four goals in the first half of Arsenal's 10–2 victory against Burgenland XI on 29 July 2008. He scored his first Premier League goal of the season against Bolton Wanderers and within 90 seconds provided an assist for Eboué to score. Bendtner had a hard time in October and November, but on 25 November, he scored a controversial 87th-minute winner against Dynamo Kyiv in the Champions League to ensure Arsenal progressed to the knockout stages. After treatment to an injured player, with Dynamo apparently expecting the ball to be returned to them, Fàbregas hit the ball forward and Bendtner scored with a left-footed shot. He was booked for removing his shirt in celebration. In January, he scored two more goals as a substitute, late winners at home to Bolton and Hull City, both from Van Persie crosses. On 24 February, Bendtner was goaded after missing a number of chances in the 1–0 win over Roma in the Champions League knockout stages. The following week, he scored two goals at West Bromwich Albion as Arsenal won 3–1. The fans were much more supportive towards him when he missed a string of chances against Blackburn Rovers. Arsenal still won 4–0, thanks to Andrey Arshavin's stunner, and a brace from Eboué. Bendtner got a goal in a 3–1 win at Newcastle United, a header from a long free-kick. On 5 May 2009, the 21-year-old Bendtner was seen leaving a nightclub hours after Arsenal's 3–1 home defeat by rival side Manchester United in the Champions League semi-final, pictured with his belt undone and jeans pulled down. He later said: "I may be young, but my actions were a poor error of judgment and something I deeply regret." Bendtner was a second-half substitute for Arsenal, who lost 4–1 on aggregate to defending champions United. Bendtner made amends with a goal, albeit a consolation, in a 4–1 defeat to London rival club Chelsea. Bendtner started the 2009–10 season by announcing a change in his Arsenal squad number from 26, which he had been allocated initially, to 52, which he claimed was "a special number to [him] personally". He agreed to refund any supporters who had already bought a shirt printed with his original number. He scored his first goal of the season in the Champions League group stage in a 3–2 away win against Standard Liège. On the morning of 27 September, he was involved in a car accident while driving along the A1. He suffered cuts to his knees and shoulder pain, and wrote off his Aston Martin. He returned to action on 4 October and scored his first league goal of the season in Arsenal's 6–2 win over Blackburn Rovers. On 28 October, he scored the winning goal in the League Cup in a 2–1 win against Liverpool. On 10 November, Bendtner underwent surgery in Germany after aggravating a groin injury in the 3–0 win on 31 October playing against Tottenham Hotspur. He was expected to be out for up to four weeks, but did not return until 27 January in a 0–0 draw at Villa Park. He started his first match after recovering from his injury and played 82 minutes in Arsenal's victory over Liverpool on 10 February to complete his return to full fitness. Ten days later, he scored his first league goal since October with the opener in a 2–0 home defeat of Sunderland. He followed this up with the equalising goal in a 3–1 win against Stoke City at the Britannia Stadium on 27 February. On 9 March, Bendtner scored the first hat-trick of his professional career in a 5–0 victory over Porto in the second leg of the Champions League first knockout round to overturn their 2–1 loss in the first leg. Four days later, he scored a stoppage-time winning goal against Hull City to put the Gunners level on points with Chelsea at the top of the Premier League. Another stoppage-time winner followed in the 1–0 victory over Wolverhampton Wanderers on 3 April. Bendtner won the Arsenal Player of the Month award for his performances in March, taking over 33% of the votes. He scored the only goal for Arsenal in a 4–1 defeat to Barcelona at the Camp Nou as they were knocked out of the Champions League in the quarter-final on 6 April. After worsening his groin problem during the 2010 World Cup, and spending almost four months out of action, Bendtner's first appearance of the season came as a substitute against Birmingham City on 16 October. On 24 October, he scored his first goal of the season in a 3–0 away win against Manchester City. Three days later, he scored again in a match against Newcastle United in the League Cup at St James' Park, as Arsenal won 4–0. Bendtner scored his first goal of 2011 on 25 January against Ipswich Town in the League Cup, to level the aggregate score at 1–1. Arsenal won the match 3–0, and 3–1 on aggregate. The goal earned him the Arsenal Goal of the Month award for January. On 2 March, Bendtner scored a hat-trick in the FA Cup fifth round replay against League One team Leyton Orient. it was his first hat-trick for nearly a year, and the first by an Arsenal player in an FA Cup tie since Ian Wright's against Yeovil Town in 1993. Bendtner was left out of Arsenal's 2011 summer tour of Asia while talks took place over a transfer. Amid rumours of interest from Stoke City and Borussia Dortmund, as well as confirmed interest from Hamburg sporting director Frank Arnesen, Bendtner made public his desire to leave Arsenal in August, citing the need for first-team football as motivation. On the last day of the August 2011 transfer window, Premier League club Sunderland completed a one-year loan deal for Bendtner; the striker linked up again with manager Steve Bruce. A couple of days later, Bendtner was reported as saying that he would never play for Arsenal again because he was not given the opportunity to establish himself in the first team after his car accident. On his debut, he made an assist against Chelsea. His first goal came on 1 October to begin Sunderland's comeback from 2–0 down to draw with West Bromwich Albion, and he made the cross from which Ahmed Elmohamady equalised. Bendtner had to wait three weeks for the Dubious Goals Committee to credit him with the goal, which had gone into the net off Gareth McAuley. Bendtner's second goal for Sunderland came in injury time against Bolton Wanderers; the match ended 2–0 and was Sunderland's first away win of the season. He scored his third in a 3–2 win at Queens Park Rangers. On 21 January 2012, Bendtner fractured his eye-socket in a collision during Sunderland's match against Swansea City on 21 January 2012; when he returned to action, he wore a protective facemask. He converted a penalty in the Tyne-Wear derby on 4 March to put Sunderland 1–0 up, and scored again the following week to give his team a 1–0 victory against Liverpool. In Sunderland's 3–1 victory at home to Queens Park Rangers, he scored the opening goal with an "unstoppable" header, and took his total for March to four from five matches with Sunderland's second goal in a 3–3 draw away to Manchester City. He finished the season as Sunderland's top scorer in Premier League matches with eight goals. On the last day of the August 2012 transfer window, Bendtner joined Italian Serie A club Juventus on loan for the season, with an option to make the move permanent. He made his debut as a substitute for Fabio Quagliarella in a 2–0 win against Chievo at the Juventus Stadium on 22 September 2012, and his first start came five weeks later in a 1–0 win against Catania. He again started in the Coppa Italia match against Cagliari in December, but suffered a thigh injury that required surgery and was expected to be out for at least two months. While he was ruled out through injury, he was at the centre of controversy when he was arrested for drink driving on 4 March 2013. Bendtner did not return to action until Juventus's last league match of the season with the title already secured. Coming on as a 74th-minute substitute in the 3–2 defeat away to Sampdoria on 18 May 2013, he fractured his wrist late in the game. He finished his season with only two league starts and without a goal in eleven appearances in all competitions. Juventus chose not to make the loan move permanent, and Bendtner returned to Arsenal. On 22 September 2013, Bendtner was an unused substitute against Stoke City. Three days later, he made his first Arsenal appearance for two years in a League Cup match against West Bromwich Albion. He made the assist for Thomas Eisfeld's goal as the match finished 1–1 after extra time. Bendtner played the whole 120 minutes and scored Arsenal's first penalty as they won the shoot-out 4–3. He scored his first Arsenal goal since March 2011 with a second-minute header in a 2–0 win against Hull Cuty on 4 December. On 1 January 2014, Bendtner scored his last goal for Arsenal against Cardiff City in the 88th minute, injuring his ankle in the process before Theo Walcott sealed a 2–0 win. Although he had hoped to prove himself to Arsenal, this did not happen, and he was released at the end of the season when his contract expired. On 15 August 2014, Bendtner signed a three-year deal with VfL Wolfsburg of the Bundesliga. Managing director Klaus Allofs described him as "a striker at the best age, who already was able to gather a lot of international experience in his career, which did not always run in a straight line". Bendtner made his Wolfsburg debut on 30 August, as a second-half substitute against Eintracht Frankfurt in a match that finished 2–2. On 6 November, he scored his first two goals for Wolfsburg, one from the penalty-spot and one from open play, in a 5–1 win against Krasnodar in the Europa League. Sixteen days later, he scored his first Bundesliga goal, against Schalke 04 in a 3–2 away defeat. On 19 March 2015, he scored an 89th-minute winner against Inter Milan at the San Siro to secure a 5–2 aggregate victory that took Wolfsburg to the quarter-final of the Europa League. Bendtner was an unused substitute as Wolfsburg beat Borussia Dortmund 3–1 in the 2015 DFB-Pokal Final. Bendtner began his second season at Wolfsburg with the 2015 DFL-Supercup against Bayern Munich: he produced a "poacher's finish" in the 89th minute from Kevin De Bruyne's cross to draw the game level at 1–1 and then scored the winner in the penalty shootout to clinch the trophy. On 8 August 2015, he continued his good form by scoring in a 4–1 win at Stuttgarter Kickers in the first round of the 2015–16 DFB-Pokal, and opened his Bundesliga account for the season two weeks later with a goal in a 1–1 draw with 1. FC Köln. On 25 April 2016, Wolfsburg announced that Bendtner's contract, which was due to run until June 2017, had been terminated with immediate effect. While a free agent, Bendtner trained with his hometown club F.C. Copenhagen. On 7 September 2016, Bendtner signed a two-year deal with English Championship club Nottingham Forest. He made his debut for the club on 20 September in the 2016–17 EFL Cup against former club Arsenal, after which Arsène Wenger asserted that "if he keeps fit he still has a chance to come back to the top level. I think a hungry Nicklas Bendtner can score goals against anybody, and that's what you want from him." Bendtner finished his Forest career with two goals from seventeen appearances in all competitions. On 6 March 2017, Bendtner signed for Norwegian club Rosenborg for an undisclosed fee. He made his debut as a second-half substitute in the Mesterfinalen of 2017 against Brann, and supplied the assist for the second goal in a 2–0 win. He also scored his first league goal in his Eliteserien debut against Odds at Lerkendal. On 12 August, Bendtner scored a trivela goal from outside the penalty box in a 2–1 win over Molde FK. Bendtner won his second consecutive Mesterfinalen in the 2018 event, scoring the only goal of the game against Lillestrøm, nutmegging defender Marius Amundsen en route to goal. Bendtner started his international career with three matches for the Denmark under-16 team in February 2004. During his third game he scored a hat-trick against Armenia. He then scored six goals in 15 appearances for the under-17s, and was named Danish Under-17 Player of the Year for 2004. Bendtner made his under-21 debut on 17 May 2006, at the age of 18, scoring both goals in a Danish 2–0 victory over Spain in a friendly match. He was the youngest player selected for Denmark's squad for the 2006 European Under-21 Championships, and replaced Morten "Duncan" Rasmussen in the Danish starting line-up. When Rasmussen came on to replace Bendtner during the match against the Netherlands, Bendtner told the press afterwards that the change was a mistake and that he was a better striker than Rasmussen. He received a reprimand, apologised to his teammates, and retained the starting position for Denmark's remaining group match before they were eliminated. On 16 August 2006, Bendtner made his first senior appearance for Denmark; aged 18 years and 212 days, he was the seventh youngest debutant ever. He started the match, a friendly against Poland, and scored after 32 minutes, helping Denmark to a 2–0 win. On 1 September, he played his second senior match for his country, as a substitute in a friendly against Portugal. He scored the final goal in a 4–2 win for Denmark. Although he still qualified to play for the U21s, Bendtner soon earned a starting place for the senior team; he scored two goals in UEFA Euro 2008 qualifiers. In the 2010 World Cup qualifiers, Bendtner scored an 84th-minute goal against Portugal to make the score 1–1; Denmark went on to win 3–2. He scored again in the reverse fixture against Portugal which ended 1–1, and four days later scored a header against Albania in another 1–1 draw. He assisted Jakob Poulsen's goal in Denmark's 1–0 win over Sweden, which meant they qualified for the 2010 FIFA World Cup. He ended the campaign with three goals. For his contribution, he was voted Danish Player of the Year and his goal against Portugal won the Goal of the Year award. Bendtner was selected by coach Morten Olsen for the World Cup squad. He played in all three of Denmark's group matches, and scored his country's first goal of the 2–1 win against Cameroon. Bendtner turned down the opportunity of representing his country at the 2011 European Under-21 Championships because he wanted to "spend some quality time with [his] young son". In qualifying for UEFA Euro 2012, he scored two goals for the senior team in a 2–0 win against Norway on 6 September 2011. On 11 October, he scored a "second-half tap-in" against Portugal to ensure Denmark qualified for Euro 2012. In friendlies in November, Bendtner scored against both Sweden and Finland; in the latter match, he "finished a fine counterattacking move to net the winning goal". Bendtner was selected in the Denmark squad for Euro 2012. A Sports Illustrated preview described him as "tall and powerful, capable of acting as a target man, yet also has the technical gifts to play deeper or on the flank." On 13 June, he scored twice in Denmark's narrow 3–2 defeat to Portugal in the second group match. After scoring his second goal, Bendtner revealed the logo of a bookmaker on his underpants, in an instance of ambush marketing for which UEFA banned him for one 2014 World Cup qualifying match and fined him €100,000. The company paid the fine. On 12 October 2012, he scored the equalising goal in a 1–1 draw with Bulgaria in a World Cup qualifier, and received a yellow card when playing against Italy four days later. In March 2013, after Bendtner's arrest for drink driving, the Danish Football Association (DBU) suspended Bendtner from consideration for national team selection for six months. According to their statement: "The DBU have demanded that Nicklas Bendtner take six months off to think over his international future. The DBU respect the rights of all players to have a private life, but we also have certain rules that need to be met by international players in their public behaviour." On his next appearance, in the return fixture against Italy, he scored both of Denmark's goals in a 2–2 draw and was yellow-carded for removing his shirt in celebration. An ankle injury sustained on club duty with Arsenal resulted in Bendtner being sidelined from international football until a friendly against England at Wembley Stadium in March 2014, in which he played the first 63 minutes. In the first round of international call-ups after Bendtner's transfer to Wolfsburg, he was left out of the Denmark squad by Morten Olsen, who named Martin Braithwaite as his sole striker for a friendly against Turkey and a Euro 2016 qualifier against Armenia. In March 2015, he scored a hat-trick as Denmark came from behind to beat the United States 3–2 in a friendly at Aarhus. He was named in Denmark's preliminary 35-man squad for the 2018 World Cup, and retained his place when the group was reduced to 27, but a groin injury sustained on club duty meant he was not included in the final 23. Bendtner is as versatile forward who is capable of playing in several attacking positions. Although his preferred role is as a centre-forward, he has also been used out wide on either flank. A large, tall, and physically strong player, he is known for his ability in the air and possesses a powerful header. Considered a promising but undisciplined player in his youth, he was regarded as "a player blessed with a fabulous all-round talent", and a quick, intelligent, and hard-working striker, with a good positional sense, first touch, tactical awareness, and an ability to score goals or hold up the ball and create chances. His former Arsenal manager Arsène Wenger once labelled Bendtner as a potentially "unstoppable striker", and also described him as a player who as a youngster was "good in the air", and who had "good technique, good stature, good pace, ... good link play", also adding that "he had it all in the locker." Despite his talent and confidence in his abilities, Bendtner has often struggled with injuries, which have limited his fitness; he has also been criticised in the media for his perceived arrogance, mentality, and inconsistency, as well as his off-field antics, and as a result, he has been accused of failing to live up to his potential. In November 2009, it was reported that Bendtner was seen in Hyde Park with former Baroness Caroline Iuel-Brockdorff, a socialite and close friend of the Danish Royal Family. In 2008 she divorced banker Rory Fleming, nephew of James Bond writer Ian Fleming, with whom she has two children. The couple met when Iuel-Brockdorff was filmed renovating her family home, Valdemar's Castle, on a reality show. Bendtner was a guest and they did a photoshoot together to promote his appearance. In December 2010, Iuel-Brockdorff gave birth to Bendtner's son at London's Portland Hospital. The couple separated soon afterwards. Bendtner has a cult following who refer to him as "Lord Bendtner". In March 2015, Danish celebrity tabloid Se og Hør bought him a square foot of land in Scotland to bestow him the title of "Lord", and according to his agent, he considered it a "fun gimmick". Bendtner has also taken part in the joke, uploading on Instagram a poster of him holding the Ballon d'Or and running as a candidate for Prime Minister in the June 2015 Danish election. During his time at Rosenborg, Bendtner was dubbed "Emperor" as Mushaga Bakenga was already the Lord at Rosenborg. In November 2018 Bendtner was sentenced to 50 days in prison in Denmark for assaulting a taxi driver. On November 21, Bendtner and his lawyer dropped the appeal, accepting that Bendtner will sentence either in jail or house arrest. As of match played 27 March 2018. Denmark score listed first, score column indicates score after each Bendtner goal. ^ a b "Nicklas Bendtner". Barry Hugman's Footballers. Retrieved 14 April 2017. ^ "Player Profile: Nicklas Bendtner". Vfl Wolfsburg. Archived from the original on 5 November 2014. Retrieved 4 February 2015. ^ a b "Biography". Nicklas Bendtner personal website. Bendtner Consulting. Archived from the original on 2 April 2011. Retrieved 15 September 2010. ^ a b "Nicklas Bendtner keen on return to centre stage for Arsenal". The Guardian. London. 22 September 2009. Retrieved 20 May 2010. ^ a b c d "Vialli: "Bendtner è bravo ma non deve fare il fenomeno"" [Vialli: "Bendtner is good but he doesn't have to play the superstar"]. Tuttosport (in Italian). 1 September 2012. Archived from the original on 18 November 2012. Retrieved 27 February 2017. ^ a b "Arsenal banking on Nicklas Bendtner to overcome Barcelona". The Guardian. Press Association. 6 April 2010. Retrieved 11 April 2017. ^ a b c d e f g h i j "Nicklas Bendtner: A-Landshold (Alle kampe)" [A-internationals (all matches)] (in Danish). Dansk Boldspil-Union. Retrieved 26 August 2018. ^ a b c "Player profile: Nicklas Bendtner – Biography". Arsenal F.C. Archived from the original on 26 January 2013. Retrieved 20 October 2010. ^ "Birmingham capture third Gunner". BBC Sport. 4 August 2006. Retrieved 25 March 2007. ^ "On-loan Bendtner scores winner on Birmingham debut". Arsenal F.C. 7 August 2006. Archived from the original on 15 October 2012. Retrieved 20 October 2010. ^ "Bendtner extends Blues stay". Birmingham City F.C. 28 December 2006. Archived from the original on 7 July 2011. Retrieved 20 October 2010. ^ "Bendtner signs five-year contract". BBC Sport. 23 May 2007. Retrieved 23 May 2007. ^ Taylor, Daniel (31 October 2009). "Nicklas Bendtner ignores doubters to concentrate on his Arsenal masterplan". The Guardian. London. Retrieved 7 November 2009. ^ "Bendtner on target in Arsenal win". BBC Sport. 28 July 2007. Retrieved 16 April 2017. ^ a b "Games played by Nicklas Bendtner in 2007/2008". Soccerbase. Centurycomm. Retrieved 16 April 2016. ^ Spiro, Matthew (24 October 2007). "Seven for Arsenal in record victory". UEFA. Retrieved 16 April 2017. ^ Clarke, Richard (22 December 2007). "Arsenal 2–1 Tottenham Hotspur". Arsenal F.C. Retrieved 11 April 2017. ^ "Nicklas Bendtner profile". ESPNsoccernet. Archived from the original on 23 September 2010. Retrieved 28 January 2011. Scoring his first Premier League goal – the winner against Tottenham in December 2007 – and picking up the record for the fastest goal ever scored by a substitute (1.8 seconds). ^ Bandini, Paolo (29 December 2007). "Everton 1–4 Arsenal". The Guardian. London. Retrieved 11 April 2017. ^ Clarke, Richard (6 January 2008). "Burnley 0–2 Arsenal". Arsenal F.C. Retrieved 11 April 2017. ^ "Games played by Nicklas Bendtner in 2007/2008". Soccerbase. Centurycomm. Retrieved 11 April 2017. ^ Hytner, David (14 September 2009). "Robin van Persie voices Arsenal distate at Emmanuel Adebayor's antics". The Guardian. London. Retrieved 11 April 2017. ^ Fifield, Dominic (23 January 2008). "Arsenal at war as Adebayor clash bloodies Bendtner nose". The Guardian. London. Retrieved 20 May 2010. ^ "Arsenal pair escape FA punishment". BBC Sport. 24 January 2008. Retrieved 11 April 2017. ^ Hughes, Ian (1 March 2008). "Arsenal 1–1 Aston Villa". BBC Sport. Retrieved 28 January 2011. ^ Clarke, Richard (28 July 2008). "Burgenland XI 2–10 Arsenal". Arsenal F.C. Retrieved 31 January 2011. ^ Hassan, Nabil (20 September 2008). "Bolton 1–3 Arsenal". BBC Sport. Retrieved 31 January 2011. ^ Winter, Henry (25 November 2008). "Nicklas Bendtner sends Cesc Fabregas's Arsenal into Champions League last 16". Daily Telegraph. London. Retrieved 24 September 2013. ^ Hughes, Ian (10 January 2009). "Arsenal 1–0 Bolton". BBC Sport. Retrieved 31 January 2011. ^ Ashenden, Mark (17 January 2009). "Hull 1–3 Arsenal". BBC Sport. Retrieved 31 January 2011. ^ Harris, Chris (24 February 2009). "Arsenal 1–0 AS Roma". Arsenal F.C. Retrieved 11 April 2017. ^ Hughes, Ian (3 March 2009). "West Brom 1–3 Arsenal". BBC Sport. Retrieved 31 January 2011. ^ Clarke, Richard (14 March 2009). "Arsenal 4–0 Blackburn Rovers". Arsenal F.C. Retrieved 11 April 2017. ^ Hassan, Nabil (21 March 2009). "Newcastle 1–3 Arsenal". BBC Sport. Retrieved 31 January 2011. ^ "Bendtner goes on bender". The Copenhagen Post. 7 May 2009. Archived from the original on 5 August 2011. ^ Clarke, Richard (10 May 2009). "Arsenal 1–4 Chelsea". Arsenal F.C. Retrieved 11 April 2017. ^ "Bendtner explains switch of squad number". Arsenal F.C. 12 August 2009. Archived from the original on 8 September 2009. Retrieved 11 April 2017. ^ a b c "Games played by Nicklas Bendtner in 2009/2010". Soccerbase. Centurycomm. Retrieved 16 April 2016. ^ "Nicklas Bendtner out for Arsenal after being involved in car accident". The Guardian. London. 28 September 2009. Retrieved 26 July 2010. Benammar, Emily (29 September 2009). "Nicklas Bendtner car crash photo: Arsenal striker's lucky escape". Daily Telegraph. London. Retrieved 26 July 2010. ^ McCarra, Kevin (28 October 2009). "Nicklas Bendtner strikes for Arsenal to remind Liverpool of the joys of youth". The Guardian. London. Retrieved 15 April 2017. ^ "Bendtner to undergo groin surgery". BBC Sport. 10 November 2009. Retrieved 10 November 2009. ^ Clarke, Richard (27 January 2010). "Aston Villa 0–0 Arsenal". Arsenal F.C. Retrieved 11 April 2017. ^ Clarke, Richard (10 February 2010). "Arsenal 1–0 Liverpool". Arsenal F.C. Retrieved 11 April 2017. ^ Bevan, Chris (20 February 2010). "Arsenal 2–0 Sunderland". BBC Sport. Retrieved 11 April 2017. ^ Sheringham, Sam (27 February 2010). "Stoke 1–3 Arsenal". BBC Sport. Retrieved 11 April 2017. ^ Wilson, Jeremy (11 March 2010). "Arsenal striker Nicklas Bendtner able to enjoy last laugh after hat-trick against Porto". Daily Telegraph. London. Retrieved 3 July 2013. ^ Dawkes, Phil (13 March 2010). "Hull 1–2 Arsenal". BBC Sport. Retrieved 11 April 2017. ^ Dawkes, Phil (3 April 2010). "Arsenal 1–0 Wolverhampton". BBC Sport. Retrieved 11 April 2017. ^ "Bendtner is EA SPORTS Player of the Month!". Arsenal F.C. 8 April 2010. Archived from the original on 27 September 2013. Retrieved 3 July 2013. ^ Roach, Stuart (6 April 2010). "Barcelona 4–1 Arsenal (agg 6–3)". BBC Sport. Retrieved 3 July 2013. ^ "Nicklas Bendtner groin injury worry for Arsenal". BBC Sport. 6 July 2010. Retrieved 15 April 2017. "No regrets over World Cup injury nightmare, says Arsenal striker". Hackney Gazette. 7 October 2010. Retrieved 15 April 2017. ^ Clarke, Richard (16 October 2010). "Arsenal 2–1 Birmingham City". Arsenal F.C. Retrieved 3 July 2013. ^ Clarke, Richard (24 October 2010). "Manchester City 0–3 Arsenal". Arsenal F.C. Retrieved 3 July 2013. ^ Taylor, Louise (27 October 2010). "Arsenal build on lucky rebound to swagger past Newcastle United". The Guardian. London. Retrieved 3 July 2013. ^ Fletcher, Paul (25 January 2011). "Arsenal 3–0 Ipswich (agg 3–1)". BBC Sport. Retrieved 3 July 2013. ^ "Arsenal Goal of the Month". Arsenal F.C. 8 February 2011. Archived from the original on 24 September 2015. Retrieved 13 April 2017. ^ Stevenson, Jonathan (2 March 2011). "FA Cup football as it happened". BBC Sport. Retrieved 13 April 2017. ^ "Arsenal 5–0 Leyton Orient". Eurosport. 2 March 2011. Retrieved 15 November 2017. ^ Dawkes, Phil (9 July 2011). "Arsenal duo Manuel Almunia & Nicklas Bendtner in move talks". BBC Sport. Retrieved 1 September 2014. ^ a b "Nicklas Bendtner reveals he wants to leave Arsenal". BBC Sport. 8 August 2011. Retrieved 1 September 2014. ^ "Hamburg confirm interest in Arsenal striker Nicklas Bendtner". BBC Sport. 12 July 2011. Retrieved 1 September 2014. ^ "Arsenal's Nicklas Bendtner joins Sunderland on season-long loan". BBC Sport. 31 August 2011. Retrieved 1 September 2011. ^ O'Rourke, Pete (2 September 2011). "Bendtner in Gunners quit vow". Sky Sports. Retrieved 13 April 2017. ^ Rayner, Stuart (12 September 2011). "Sunderland 1 Chelsea 2". The Journal. Newcastle. Retrieved 13 April 2017. ^ Edwards, Luke (1 October 2011). "Sunderland 2 West Bromwich Albion 2: match report". Daily Telegraph. Retrieved 13 April 2017. ^ "Black Cats pair credited with goals". Sunderland A.F.C. 19 October 2011. Archived from the original on 20 October 2011. ^ Ashton, Becky (22 October 2011). "Bolton 0–2 Sunderland". BBC Sport. Retrieved 13 April 2017. ^ a b c d "Games played by Nicklas Bendtner in 2011/2012". Soccerbase. Centurycomm. Retrieved 13 April 2017. ^ "Sunderland striker Nicklas Bendtner feared he was blinded". BBC Sport. 8 March 2012. Retrieved 13 April 2017. ^ Johnston, Neil (4 March 2012). "Newcastle United 1–1 Sunderland". BBC Sport. Retrieved 16 April 2017. ^ Taylor, Louise (10 March 2012). "Liverpool's Champions League hopes fade after defeat by Sunderland". The Observer. London. Retrieved 15 April 2017. ^ Johnston, Neil (24 March 2012). "Sunderland 3–1 QPR". BBC Sport. Retrieved 16 April 2017. ^ "Sunderland squad details 2011/12". Soccerbase. Centurycomm. Retrieved 16 April 2017. ^ "Bendtner completes Juventus switch". Juventus Football Club. 31 August 2012. Archived from the original on 3 September 2012. Retrieved 31 August 2012. ^ "Fabio Quagliarella powers Juventus over Chievo Verona: Serie A". CBC Sports. Associated Press. 22 September 2012. Retrieved 13 April 2017. ^ a b c d e f g h "N. Bendtner: Summary". Soccerway. Perform Group. Retrieved 26 August 2018. ^ "On-loan Arsenal striker Nicklas Bendtner undergoes thigh surgery". The Independent. Press Association. 18 December 2012. Retrieved 18 January 2013. ^ a b "Nicklas Bendtner gets Denmark ban after drink driving arrest". BBC Sport. 4 March 2013. Retrieved 5 March 2013. ^ "Arsenal's on-loan striker Nicklas Bendtner arrested for drink-driving". Daily Telegraph. London. 4 March 2013. Retrieved 27 February 2017. ^ a b "Nicklas Bendtner: Arsenal striker fractures wrist with Juventus". BBC Sport. 20 May 2013. Retrieved 27 February 2017. ^ a b c d e f Wilson, Paul (25 September 2013). "Nicklas Bendtner, a legend only to him, must take last Arsenal chance". The Guardian. London. Retrieved 13 April 2017. ^ Magowan, Alistair (22 September 2013). "Arsenal 3–1 Stoke City". BBC Sport. Retrieved 26 September 2013. ^ "West Brom 1–1 Arsenal". BBC Sport. 25 September 2013. Retrieved 26 September 2013. ^ Magowan, Alistair (4 December 2013). "Arsenal 2–0 Hull City". BBC Sport. Retrieved 4 December 2013. ^ Cryer, Andy (1 January 2014). "Arsenal 2–0 Cardiff City". BBC Sport. Retrieved 1 January 2014. ^ a b "Games played by Nicklas Bendtner in 2013/2014". Soccerbase. Centurycomm. Retrieved 16 April 2016. ^ "Bendtner aims to leave mark at Arsenal". ESPN FC. PA Sport. 6 March 2014. Retrieved 13 April 2017. ^ "Premier League: Denmark forward Nicklas Bendtner heads a list of 11 exiting Arsenal". Sky Sports. 26 June 2014. Retrieved 13 April 2017. ^ "Wolfsburg sign former Arsenal striker Nicklas Bendtner". Sky Sports. 15 August 2014. Retrieved 15 August 2014. ^ "Home debut draw". VfL Wolfsburg. 30 August 2014. Retrieved 13 April 2017. ^ "Wolfsburg ease to victory over Krasnodar". DFL Deutsche Fußball Liga. 6 November 2014. Archived from the original on 17 April 2017. Retrieved 13 April 2017. ^ Menicucci, Paolo (19 March 2015). "Inter beaten again as Wolfsburg march on". UEFA. Retrieved 13 April 2017. ^ a b Chowdhury, Saj (30 May 2015). "Borussia Dortmund 1–3 Wolfsburg". BBC Sport. Retrieved 13 April 2017. ^ a b "Wolfsburg down Bayern on penalties to lift 2015 Supercup". DFL Deutsche Fußball Liga. 1 August 2015. Retrieved 13 April 2017. ^ "'Lord' Bendtner finally showing his true class". DFL Deutsche Fußball Liga. 27 August 2015. Retrieved 13 April 2017. ^ "Contract terminated". VfL Wolfsburg. 25 April 2016. Archived from the original on 13 May 2016. Retrieved 25 April 2016. ^ "Bendtner in training at FC Copenhagen". FourFourTwo. 5 May 2016. Retrieved 28 April 2018. ^ "Forest complete Bendtner signing". Nottingham Forest F.C. 7 September 2016. Retrieved 7 September 2016. ^ Karen, Mattias (21 September 2016). "Nottingham Forest's Nicklas Bendtner can still make it to top – Arsene Wenger". ESPN FC. Retrieved 13 April 2017. ^ a b "Games played by Nicklas Bendtner in 2016/2017". Soccerbase. Centurycomm. Retrieved 30 March 2017. ^ "Bendtner leaves the Reds". Nottingham Forest F.C. 6 March 2017. Retrieved 30 March 2017. ^ a b Murphy, Ronan (30 March 2017). "Ex-Arsenal striker Bendtner begins Rosenborg career with trophy win". Goal.com. Retrieved 30 March 2017. ^ Johannessen, Sturla (2 April 2017). "Bendtner-mål da RBK knuste Odd: – En varmerke-scoring". TV2.no (in Norwegian). Retrieved 2 April 2017. ^ "WATCH as former Nottingham Forest man Nicklas Bendtner hits stunning goal for Rosenborg". Nottingham Post. Retrieved 2 July 2018. ^ a b c "Nicklas Bendtner's outstanding solo goal hands Rosenborg the Norwegian Super Cup". FourFourTwo. 27 April 2018. Retrieved 28 April 2018. ^ "Landshold: Nicklas Bendtner: U16-landshold (Alle kampe)" [International: Nicklas Bendtner: U16 team (all matches)] (in Danish). Dansk Boldspil-Union. Retrieved 14 April 2017. 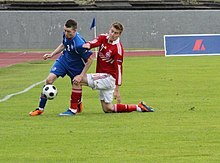 ^ "Landshold: Nicklas Bendtner: U17-landshold (Alle kampe)" [International: Nicklas Bendtner: U17 team (all matches)] (in Danish). Dansk Boldspil-Union. Retrieved 14 April 2017. ^ a b "Ungdomslandshold, herren: DBU talentpris" [Youth international, men: DBU talent award] (in Danish). Dansk Boldspil-Union. Retrieved 14 April 2017. ^ "Landshold: Nicklas Bendtner: U21-landshold (Alle kampe)" [International: Nicklas Bendtner: U21 team (all matches)] (in Danish). Dansk Boldspil-Union. Retrieved 14 April 2017. ^ a b Haisma, Marcel (26 July 2006). "European U-21 Championship 2006 – Final Tournament Details". Rec.Sport.Soccer Statistics Foundation (RSSSF). Retrieved 14 April 2017. ^ Henriksen, Troels (1 June 2012). "Euro 2012: Denmark profile – Nicklas Bendtner". The Guardian. London. Retrieved 14 April 2017. ^ Cornelius, Mette (27 May 2006). "Bendtner undskylder i U21-lejren" [Bendtner apologises in the U21 camp] (in Danish). DR (Danish Broadcasting Corporation). Retrieved 14 April 2017. ^ "A-landsholdsspillere – Yngste debutant" [A-international players – Youngest debutant]. Haslund.info (in Danish). Archived from the original on 4 October 2007. ^ "Danmark–Polen 2–0" [Denmark–Poland 2–0] (in Danish). Dansk Boldspil-Union. Retrieved 7 September 2011. ^ "Danmark–Portugal 4–2" [Denmark–Portugal 4–2] (in Danish). Dansk Boldspil-Union. Retrieved 7 September 2011. ^ "Danmark–Portugal 3–2" [Denmark–Portugal 3–2] (in Danish). Dansk Boldspil-Union. Retrieved 7 September 2011. ^ Mondal, Subhankar (10 September 2009). "Albania 1–1 Denmark: Danes retain top spot despite disappointing draw". Goal.com. Retrieved 14 April 2017. ^ Coerts, Stefan (10 October 2009). "Denmark 1–0 Sweden: Late Jakob Poulsen goal wins it for the Danes". Goal.com. Retrieved 14 April 2017. ^ a b c "Bendtner voted Danish Player of the Year". Arsenal F.C. 10 November 2009. Archived from the original on 12 November 2009. Retrieved 11 November 2009. ^ "Olsen names final Denmark squad". UEFA. 28 May 2010. Retrieved 2 June 2010. ^ "Danish fightback crushes Cameroon". FIFA. 19 June 2010. Retrieved 14 April 2017. ^ Bruun, Peter (12 May 2011). "Eriksen, Kjær delighted to get Danish U21 call". UEFA. Retrieved 14 April 2017. ^ Mark, Thomas (7 September 2011). "Bendtner glad as Denmark defeat Norway". UEFA. Retrieved 14 April 2017. ^ "The Olsen Gang's rapid rise". FIFA. 20 October 2011. Retrieved 14 April 2017. ^ "Denmark fight back to overcome Finland". UEFA. 15 November 2011. Retrieved 14 April 2017. ^ Wilson, Jonathan (1 June 2012). "Euro 2012 Preview: Denmark". Sports Illustrated. Retrieved 14 April 2017. ^ "Euro 2012: Nicklas Bendtner banned for underpants celebration". BBC Sport. 18 June 2012. Retrieved 18 June 2012. ^ "Euro 2012: Bookmaker pays fine". The Guardian. Press Association. 19 June 2012. Retrieved 19 June 2012. ^ "Denmark, Italy draw in World Cup qualifier". CBC Sports. Associated Press. 11 October 2013. Retrieved 14 April 2017. ^ Orr, James (26 February 2014). "England v Denmark: Nicklas Bendtner included in Denmark squad for Wembley friendly". The Independent. London. Retrieved 1 September 2014. Ornstein, David (5 March 2014). "England 1–0 Denmark". BBC Sport. Retrieved 1 September 2014. ^ "Denmark leave out Bendtner despite having only one striker". Eurosport. Reuters. 26 August 2014. Retrieved 15 April 2017. ^ Evans, Simon (25 March 2015). "Nicklas Bendtner's hat-trick seals victory for Denmark over USA". The Guardian. London. Retrieved 14 April 2017. ^ "Denmark coach names 35-man provisional national team squad". Associated Press. 14 May 2018. Retrieved 4 June 2018. ^ "Nicklas Bendtner out of Denmark's World Cup squad with groin injury". Sky Sports. 4 June 2018. Retrieved 4 June 2018. ^ Claridge, Steve (31 October 2006). "Nicklas Bendtner, Birmingham City". The Guardian. London. Retrieved 27 February 2017. ^ a b Herbert, Ian (19 September 2016). "Nottingham Forest vs Arsenal: 'I don't regret saying I was one of the greatest,' says Nicklas Bendtner". The Independent. London. Retrieved 27 February 2017. ^ "Bendtner off the scale in confidence test". ESPN Sports Media. 5 February 2011. Retrieved 27 February 2017. Campo, Carlo (15 August 2014). "Wolfsburg sign Nicklas Bendtner to 3-year deal". thescore.com. Retrieved 27 February 2017. Krogh, Karsten (13 September 2012). "What do you get with Bendtner?". Football Italia. Retrieved 27 February 2017. McNicholas, James (1 February 2014). "Striker search went awry last summer, not in January". ESPN FC. Retrieved 27 February 2017. Ames, Nick (16 September 2016). "Balotelli, Bendtner and why talent alone is not enough to succeed". ESPN FC. Retrieved 27 February 2017. ^ a b "Arsenal striker Nicklas Bendtner 'dating Baroness Caroline Luel-Brockdorff'". Daily Telegraph. London. 13 November 2009. Retrieved 13 April 2017. ^ Helliker, Adam (10 February 2008). "Fleming in £400m Divorce". Daily Express. London. Retrieved 29 March 2010. ^ "Farfar Bendtner er stolt" [Grandfather Bendtner is proud] (in Danish). Denmark: TV2. 17 December 2010. Retrieved 13 April 2017. ^ Wilkinson, Tom (12 March 2012). "Footballer Nicklas Bendtner cleared of cars damage". The Independent. Press Association. Retrieved 13 April 2017. ^ "Why we can officially call Nicklas Bendtner a Lord". Eurosport. 16 March 2015. Archived from the original on 19 June 2015. Retrieved 18 June 2015. ^ Sheen, Tom (19 June 2015). "Former Arsenal striker Nicklas Bendtner puts himself forward for Danish Prime Minister". The Independent. London. Retrieved 13 April 2017. ^ "Nicklas Bendtner sentenced to 50 days in jail in Denmark for assault". BBC Sport. BBC. Retrieved 2 November 2018. ^ "Nicklas Bendtner accepterer fængselsstraf". Politiken. Retrieved 25 November 2018. ^ "Games played by Nicklas Bendtner in 2005/2006". Soccerbase. Centurycomm. Retrieved 16 April 2016. ^ "Games played by Nicklas Bendtner in 2008/2009". Soccerbase. Centurycomm. Retrieved 16 April 2016. ^ "Games played by Nicklas Bendtner in 2010/2011". Soccerbase. Centurycomm. Retrieved 16 April 2016. ^ "Games played by Nicklas Bendtner in 2006/2007". Soccerbase. Centurycomm. Retrieved 3 October 2014. ^ Rollin, Glenda; Rollin, Jack, eds. (2007). Sky Sports Football Yearbook 2007–2008. London: Headline Publishing Group. pp. 46, 78–79. ISBN 978-0-7553-1664-9. ^ Johannessen, Sturla (2 April 2017). 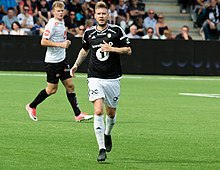 "Bendtner-mål da RBK knuste Odd: – En varmerke-scoring". TV2.no. Retrieved 2 April 2017. ^ "Årets Talent" [Talent of the year] (in Danish). Spillerforeningen (Danish Professional Footballers' Association). Archived from the original on 29 December 2016. Retrieved 14 April 2017. ^ Hansen, Kenneth (26 November 2017). "Bendtner tog topscorertitlen i debutsæson" [Bendtner took the top scorer title in his debut season]. Bold.dk (in Danish). Retrieved 26 November 2017. Wikimedia Commons has media related to Nicklas Bendtner.